On April 11, 2006, Perry Mountain M/C lost not just a club member but a part of our family with the passing of Taylor Reynolds. Taylor was 20 years old and starting to come into his own as an SERA AA rider. He had come a long way from the grinning kid on the KTM 125 to the young man he was today. 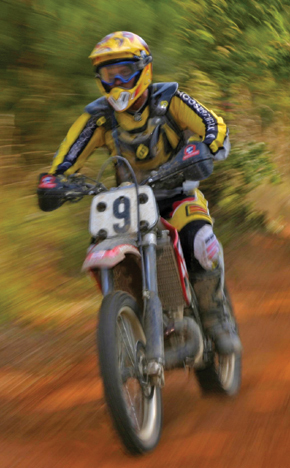 He was the leader on the first "young gun" 24 hour team at Glen Helen and was on the winning Hattiesburg Cycle Team in the 2004 24 Hour Challenge at Perry Mountain. He was SERA AA the past two years and had begun to show considerable improvement and maturity in his riding ability. Taylor was the most polite young man you would ever meet. Every response to any adult would end with "sir" or "ma'am" to the point that several of us would turn to see who he was talking to. He was always happy and playing some kind of joke on all of us. I personally remember the first time he outran me at Red Lick a few years back and I got several radio calls on the way home saying, "Mr. Dave I sure had fun today." It is with great sadness that I know I won't get those calls anymore, but I am very thankful that for a short period of time I had a young man like Taylor in my life. I know there are several more stories about Taylor and I'm sure we have all been touched by him in his special way. Taylor's memory will forever live with us at Perry Mountain. We have lost more than a club member, but a part of ourselves and someone who was like a son to many of us. Our thoughts and prayers will forever go with Taylor, Mike and their family. "Yes Sir," Godspeed, Taylor. Taylor graduated from Morgan Academy and was attending Shelton State Junior College in Tuscaloosa. 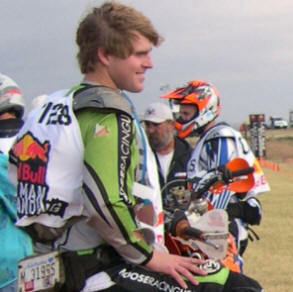 Taylor was active in motorcycle racing on several circuits with his father, brother and friends as team members. His Grandfather, Millard Reynolds, was the original founder of the Perry Mountain Motorcycle Club. Taylor is survived by his mother, Martha Reynolds, father, Mike Reynolds and his wife Lori, grandmother Betty Jean Reynolds, brother, Kyser Smith and his wife Sheri, and sister, Shelly Ellis and her husband Richard, step-sister, Morgan Hamner and step-brother, Matt Hamner, nieces, Gracie Taylor Smith, Sarah Kyser Ellis, Reynolds Ellis and Isabella Ellis. He was preceded in death by grandparents, Millard Reynolds and Mr. and Mrs. Malcolm T. Wood, niece, Elizabeth Grace, and a nephew, Richard Lee Ellis, III.